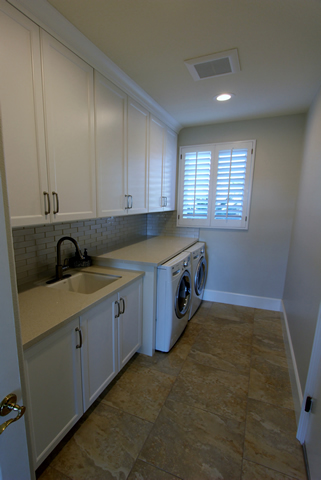 In this sleek and chic Yorba Linda home remodel, we completely upgraded the kitchen, laundry room, and the living room’s entertainment center & bar. Read on to learn how we transformed these once lackluster spaces to leisurely luxe features of the home. 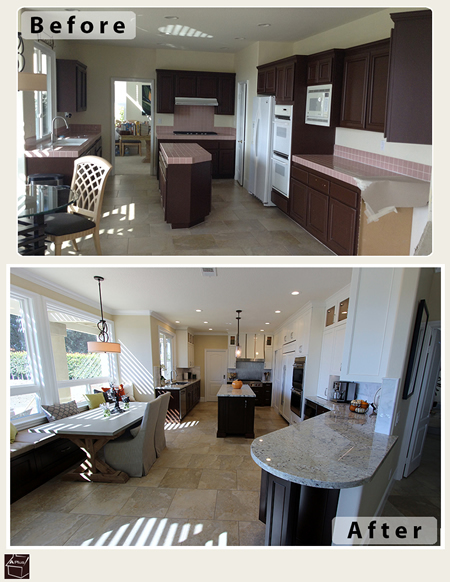 This Yorba Linda kitchen remodeling project resulted in a dramatic change. Before, the kitchen was dull and dated, with oppressively dark cabinetry, dreary mauve countertops, and clashing white appliances. After, the room became a light-filled retreat fit for indulging in gourmet cooking and entertaining guests. All new high end cabinets were immediately installed. Paint-grade maple with Shaker doors and Jianas molding was split into two colors: Dark Manganese for the lower half of the kitchen to add sophistication, and crisp DE Swiss Coffee for the upper half to bring brightness to the space. 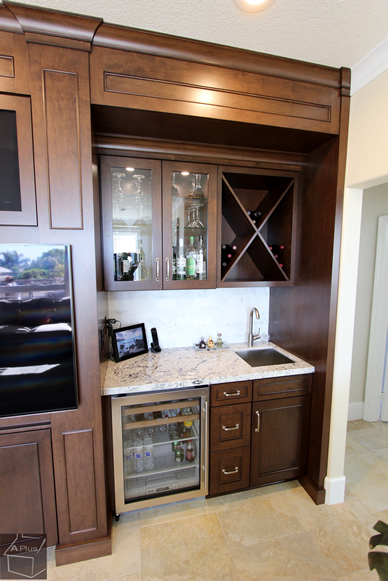 All of the cabinets feature hard rock melamine interiors and Belcastel satin nickel hardware. After the cabinet construction was complete, every appliance was updated. 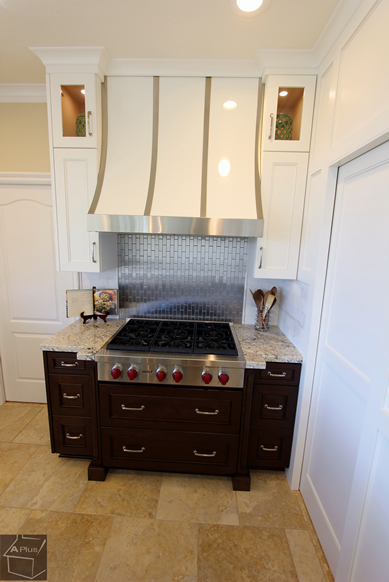 A Wolf 36” Sealed Burner Rangetop makes a statement with its red control knobs beneath a new white and stainless steel striped hood. Behind the rangetop, brushed stainless steel Maniscalco tiles form a shimmeringl full height backsplash. Wolf L Series Built-In Double Ovens were installed to the right of the Sub-Zero 48” Refrigerator, which has been outfitted with custom white panels to match with the kitchen’s upper cabinetry. Choosing a double convection model for the oven provided the homeowners with a kitchen better able to accommodate their frequent cooking and baking. Next to the ovens and just beneath the new 1 ½” straight stone edge Bianco Romano granite countertops was placed a Wolf 24” Drawer Microwave Oven. The fact that the kitchen opens up to the living room made the former light-wood entertainment center and bar big mismatches. 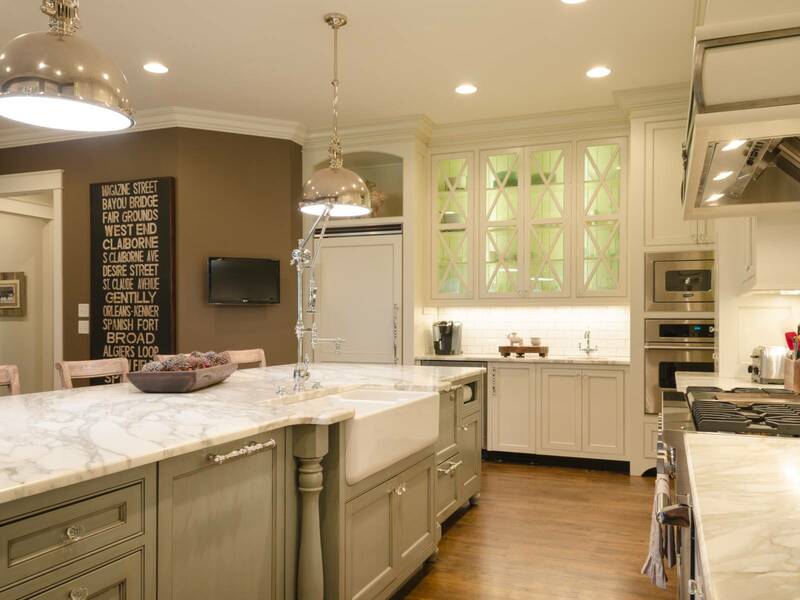 To bring a sense of unity, custom cabinets were built in the same style and color as those of the kitchen, and outfitted with the same striking granite countertops. A hidden sound center was crafted into the top compartment of the entertainment center, along with completely customized drawers and shelves to accommodate the residents’ collection of tech. At the attached bar, we installed a Sub-Zero 24” Undercounter Beverage Center with a UV-resistant glass door perfect for keeping fine spirits chilled and fresh, in addition to an Everest 17” x 17” Bar Sink with satin finish. 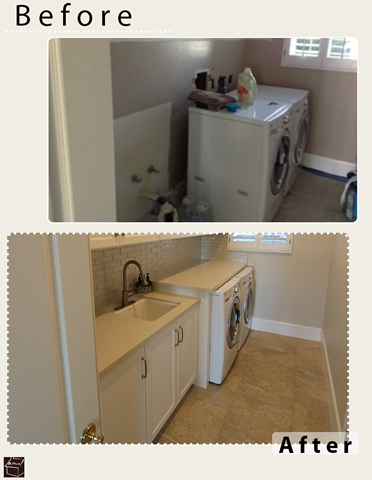 The laundry room became a place where chores now feel like an escape, thanks to the bright and clean spa-like update. 1 ½” Pantel quartz group C countertops keep things crisp with their sparkling white polished finish, and a First Snow honed Daltile backsplash enhances the effect. Scratch resistant white Thermofoil cabinets with white melamine interiors provide ideal durability for this frequently used area, while matching the classic monochrome scheme. 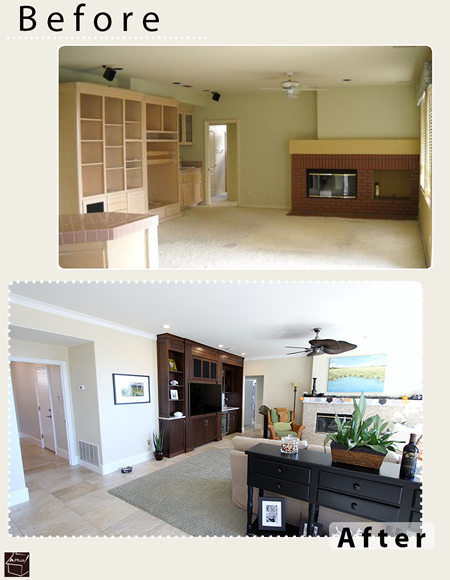 This is a complete home remodel Yorba Linda’s residents will be envious of. If you’re looking for general contracting Yorba Linda/Orange County experts that can help you create the same type of stylish change in your home, contact us today!